The lakes, rivers, waterfalls and sources of the Sibillini Mountains, like Ariadne’s thread, allow you to discover the Sibillini easily and for the most part on foot in just a couple of days, with paths leading to the most significant bodies of water in the “Blue Mountains”. 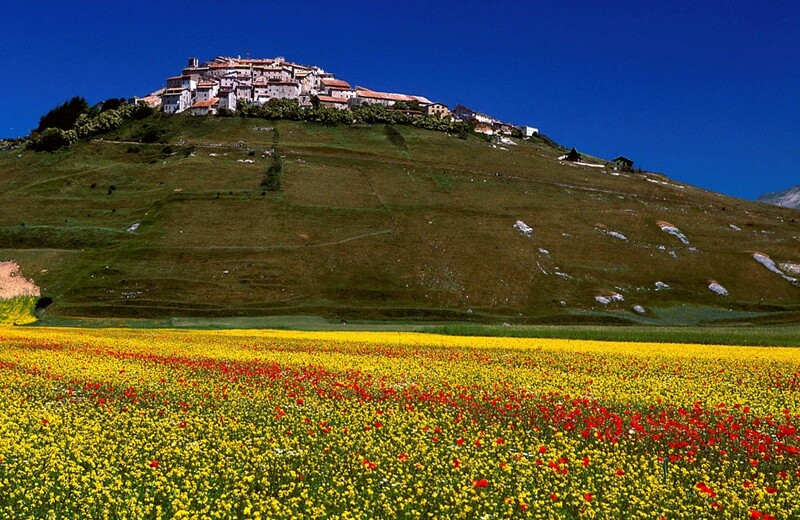 Our journey starts at Forca Canapine, in the Municipality of Norcia. Viewed from above, the plains of Castelluccio are reminiscent of the paintings of Mondrian: fields of lentils and wheat and meadows full of flowers divide the area into geometric splashes of colour, delineated by ancient paths that cross each other at right angles. In the Pliocene era, the plateau was at the bottom of a lake, then tectonic shifting and subsidence dispersed the waters that poured through a still active karst sinkhole: the deep and ramified “Fosso dei Mergani”. In the shadow of the jagged embankments, covered with moss and aquatic plants, the slow current of the sinkhole is interrupted by regular spurts and mysterious noises. This is the realm of the salamander and one of the last safe havens, in central Italy, for crested newts and mountain newts. The road down from Forca Canapine passes swampy areas and karst springs: near a pond, under the south-east face of Monte Guidone, one can observe a colony of Carex distica, a plant that grows only here in Italy. 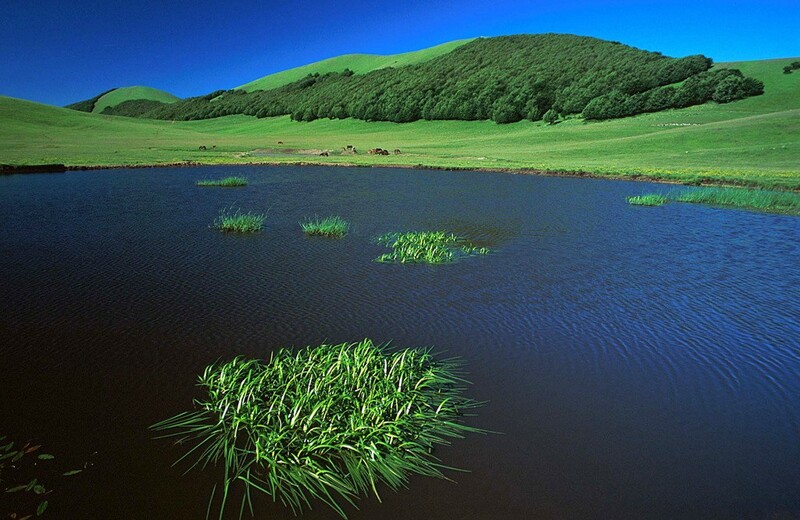 The whole plateau is interesting from the botanical point of view and extremely beautiful during the flowering period due to the abundance of karst waters and the fertility of the soil, composed mainly of lake sediments. To the north-east is a mule track, at the very top of the pass, that leads to the basin of Pantani di Accumoli, a cluster of tiny karst lakes the banks of which were partly reinforced to allow herds to drink and rest. Draft horses and cattle, left free to pasture from spring to autumn, come to water as in a procession: every herd has its fixed time set by a biological clock. Some pools are turbulent, while others, less accessible, remain calm: in the latter it is not uncommon to observe colonies of Chirocephalidae, a type of shrimp the eggs of which came here attached to the legs of a bird, perhaps one of the many dotterels circling the valley. We then go back and take the paved road to Castelluccio: perched on a hill at 1452 m, between Pian Grande and Pian Perduto, it is one of very few villages at high altitude on the Italian peninsula. And from there you cannot fail to go to the Lago di Pilato: either directly via Forca Viola or via Monte Vettore, reached from Forca di Presta. Lago di Pilato, at 1940 metres above sea level, appears from behind a rocky outcrop and looks like an amethyst at the centre of a steep and massive amphitheatre in limestone with alluvial walls, where the colours and sounds of the valley disappear. 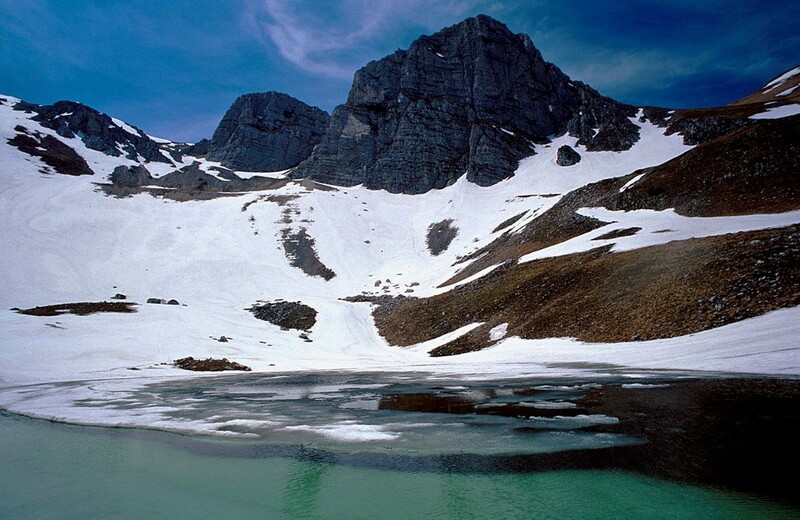 The lake is set in a glacial cirque and is fed by the snow that accumulates in abundance on the surrounding plains. The water takes on green, blue and purple hues in concentric rings with the increase in depth which, at the centre, is approximately nine metres. The shrubs that dominate the alluvial cones have greyish, almost camouflaged leaves and inconspicuous flowers, but they are rare plants, and in some cases endemic, such as the Heracleum orsinii, Linum falvum and Papaver rhaeticum. From late spring, Lago di Pilato assumes its characteristic shape of a pair of glasses, being divided into two communicating basins with a central alluvial band; while in summer, the two bodies of water are often separated completely. As the sun begins to set, the banks are populated by swarms of tiny pink diaphanous crustaceans which, curiously, swim on one side. These are Chirocephals Marchesonii, named after the scientist who first identified them in 1954. In Pian Perduto, however, between June and September, you can see “Tovel Sibillini”: a small “red pond”, so dubbed because of the colour of the water caused by a significant phenomenon known as an algal bloom currently known nowhere else in the Apennines. This phenomenon was already known to exist in the Sibillini, as it was discovered by the botanists Marchesonii and Paganelli in the quagmires of Accumoli quagmires forty years ago but then disappeared. We are now in the Marche side of the park: we go down to Castelsantangelo and Visso, where there is an abundance of springs and streams that we would like to discover little by little. But we do not have the time. We cross the plateau on which stands the Bramantesque Sanctuary of Macereto, and arrive at the lake of Fiastrone, a green pearl that man has created admirably well in a wreath of woods and mountains. We head to Montefortino, from where we enter the resort of Pisciarelle, with small streams that sparkle in the sun along a sheer wall on the river Tenna, and the gorges of the Infernaccio. Two giants close off the horizon in each direction: these are Monte Priora and Monte Sibilla, originally united by a plateau now divided by the waters of the Tenna which, like the edge of a sword, carves its way to the Adriatic. Further on, the gorges open out on a valley full of life and colour to the right. 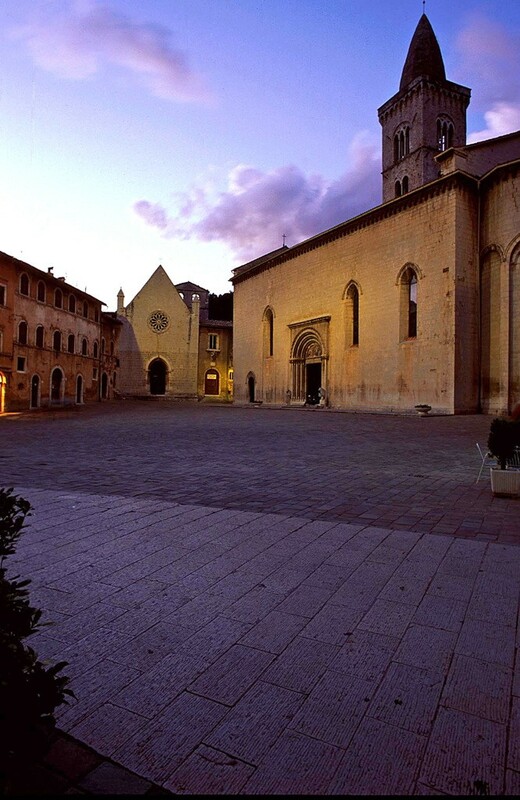 A path leads up Colle San Leonardo and you can reach the church built onto a retreat donated in 1134 by the noblewoman Drusiana to the convent of Santa Croce di Fonte Avellana. Nearby, the Salto del Rio astonishes with its unique, elegant waterfall thirty-two metres high. 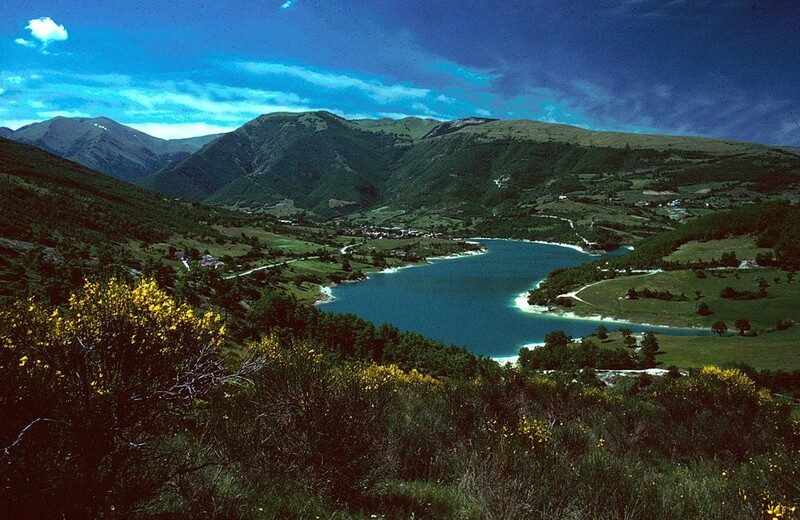 From Foce di Montemonaco, however, you can follow a classic route in the Sibillini Mountains: the Lake Valley. In summer, this glacial valley is transformed into an immense, colourful bed of flowers. From there you reach the “fonte matta,” or “crazy source”, so named because it gushes only intermittently, but it’s well worth waiting for the fresh, pure water. You can then rest in the “blue-green” Sibillini before resuming this journey at the discovery of a land that never fails to stir strong emotions.